Jumping Off Swings follows the story Ellie and her friends. Ellie is looking for someone to call her own--she just wants a kiss or a touch. The book description gave me the feeling that Ellie is a whore--but you learn that is not true in the first few pages of the book. 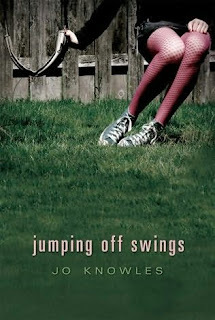 Jumping Off Swings was a very raw book in which Jo has crafted the teen voice. I read this book in a short time span and believe the middle of the story was the strongest part--I was not too fond of the end, it felt rushed and empty, I feel the author could have came to the same conclusion more efficiently. Jumping off Swings is a book worthy of any 'true life' fans bookshelf. If true life books are not your thing I would not suggest this book to you. In all, I felt that Jo's first book Lessons From A Dead Girl was a stronger story-as it was something I could easily connect with-however, Jumping Off Swings holds an important story as well, it really wasn't something I could connect with--I feel like the book is something a girl could connect with better then I did.